Casa & Family is pleased to announce the launch of a multi-function diaper backpack bag for moms and dads designed for comfort and versatility. Practical, stylish, ergonomic, durable and user friendly, the diaper backpacks made of the highest quality oxford waterproof material to last for years are now available for purchase on Amazon.com (USA). New York, NY, February 23, 2018 --(PR.com)-- The Diaper Backpack features 16 multi-function pockets for smart organization (can even easily fit a 14’ laptop), 4 insulated pockets to keep baby boys and girls beverages at the right temperature, 2 side pockets for wipes and 1 insulated large pocket, heavy duty zippers that will not break with dual zipper for easy access, waterproof compartments for used nappies or wet clothes, lightweight fabric and easy to wash and is an ideal baby bag for travelling by road or airplane, hiking or just strolling. This stylish and elegant backpack set is so convenient that it will become an essential bag when leaving home. It can be used as a backpack with its extra padded straps for additional comfort for men and women of all sizes, as a tote with padded handle to grab and go or as a stroller organizer with its’ Velcro and pressure button that offer strong and safety to attach to any stroller. 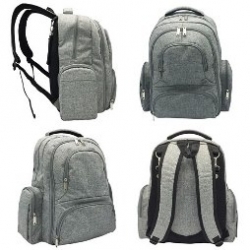 The Diaper Backpack comes with 2 stroller straps (easy to fix your backpack diaper bag to any stroller to access all baby stuff), 1 changing pad (to change newborn or toddler on a waterproof hygienic changing pad) and 1 Insulated bottle sleeve (extra-large to keep the water bottle cool or babies’ milk or juice cold). Casa & Family Diaper Backpacks bags are backed by their manufacturer 30-day Money Back Guarantee with a 100 days free replacement warranty. Casa & Family specializes in creating high quality products for mums and dads as well as household items. All our products are easy to use and our children line is made of non-toxic and environmental friendly material. To learn more about Casa & Family, visit www.casaandfamily.com or go directly to the Amazon page. Casa & Family is pleased to announce the launch of a multi-function diaper backpack bag for moms and dads designed for comfort and versatility.